I am so happy to finally be sat down and writing this review for you guys. I am sure that some of you will already know, but I am a big fan of the Benefit They’re Real Mascara. I never actually set out to try this mascara, to be quite honest it never really interested me and struck me as a product that I wanted to try out. One Christmas, my dad got me a beautiful Benefit gift set and it included a mini version of this mascara and as I started to try it out, I realised just how much I loved it. I used all of the mini tube that I had and from there it went onto my Wishlist as a product that I wanted to buy the full size of. First up, I want to talk to you guys about the packaging. If you have followed my blog for quite a while you will know that I always lead with the packaging because it is the first thing that you notice about the product. 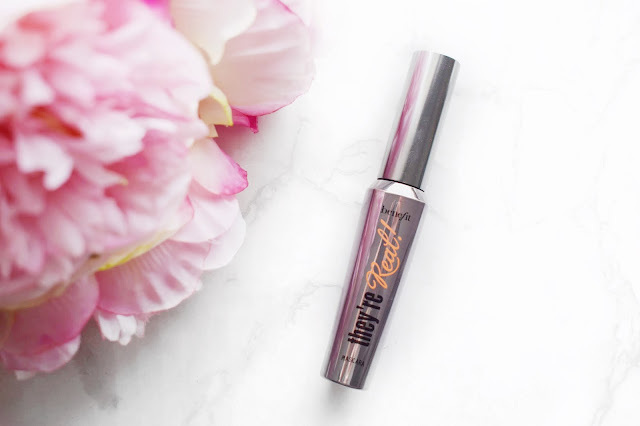 I think that this Benefit They’re Real Mascara is very pretty, and I think that the tube fits the whole aesthetic and branding as Benefit as a whole. I think that it is very nice, but at the end of the day, it is just a simple tube of mascara so there isn’t anything really special about it, but it is nicer than some of drugstore mascaras that I have in my collection. The wand of this mascara when you pull it out of the tube does look a little scary with how spikey it is. It is a plastic type of wand rather than one with bristles that looks fluffy. I find that wands like this can be really good because they do a great job at getting in-between every single lash hair and comb through it to ensure that every lash is coated from base to top and very evenly. Also, on the end of the wand there are small plastic bristles that are pointed in different directions, which are great for getting the lashes in the inner and outer corner without having to worry about getting it on your skin. The best thing about this mascara in my opinion and the reason why I wanted to get the full-size version is because how much of lift that this mascara gives to my lash hairs. With a good comb through my lashes, it elevates them so much from the base to the point where they are almost touching my brows. I have never known a mascara give me a look like this before and that is why I love it. I have tried many other mascara over the years and some lengthen the lashes, but they don’t lift them up. That really is a huge selling point for me and this stunning Benefit They’re Real Mascara. I think that once this mascara is in place and the lashes are fully coated, you know that it is going to be in place all day long. 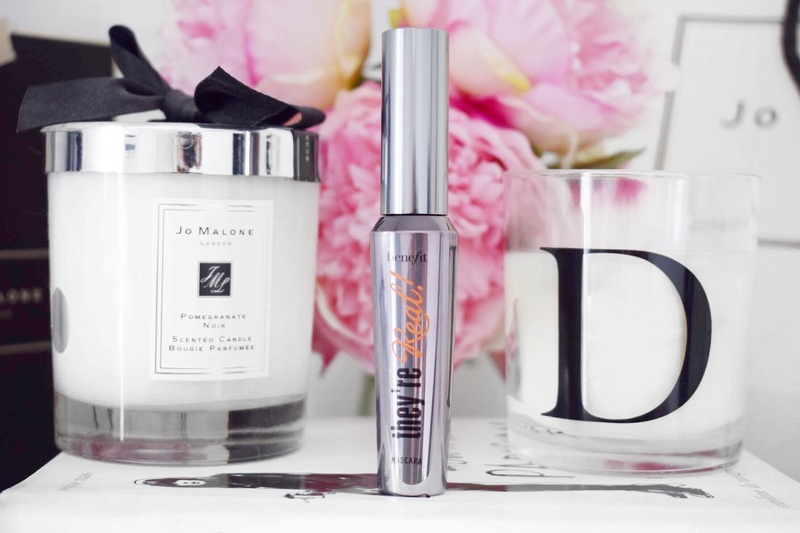 I know that when I reach for this mascara, it isn’t going to smudge underneath the eyes and it isn’t going to flake off throughout the day. 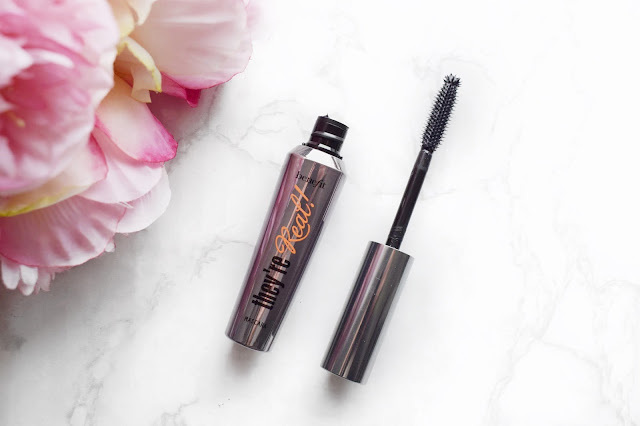 With a good coat of this on the lashes, you can really feel it start to set around your lash hairs and you know that it won’t budge from there. I don’t think that this Benefit They’re Real Mascara is marketing as being a waterproof mascara, but I can say that I have worn this while crying and even out in a downpour and it hasn’t moved a millimetre. My only negative about this mascara has to be how hard it can be to remove. Like I said above, it sets in place and it doesn’t move, but I feel like that is even the case when you are trying to remove it. I have tried to take this off using makeup wipes, makeup remover, my Clinique Take the Day Off Balm and I have even tried picking the mascara off with my fingers and it doesn’t want to budge. Sometimes, it can actually even be pretty painful while I am trying to get it off. After looking online, I have found that quite a few people seem to have the same issue with this Benefit Mascara. Overall, I really love this mascara and I love using it. On a day to day basis, I think that it is such a great mascara to use, you just have to ensure that you get every single scrap of mascara off at the end of the day. I love the way this lengthened and lifted my eyelashes and that is why I find myself reaching for it so often. If you haven’t tried this mascara before, I would highly recommend it because it has highly gone to the top of my list of my favourite mascaras. Anyway, I will add a link to this product down below in case you want to check it out for yourself. Make sure to leave me a comment and let me know if you have tried this mascara and what you thought about it! One of my most fave mascaras! It just does everything that I want a mascara to do! Heard so many good things about this one. I wear individuals now so can only wear mascara on my bottom lashes, not sure I'd be patient enough to remove this! It does take hell of a lot, but while it is on I adore it! I am so glad that I finally picked this up! I was late onto the bandwagon, but I love this product! This year I tried the bad girl bang mascara and I'm obsessed with it, so I really need to try that OG mascara that is still getting all the raves! I think I am going to have to try out some other Benefit mascaras soon! I think Roller Lash is going to be the next one on my list to try out! Me too, I think Roller Lash is going to be the next one to try out! It is amazing, stays in place all day long!